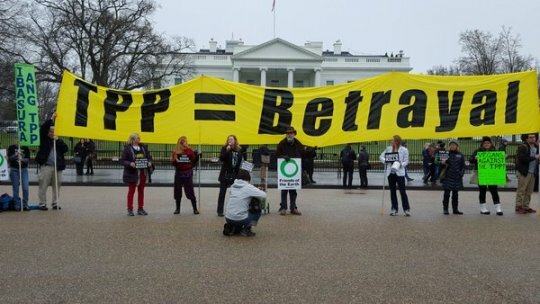 A coalition of advocacy groups staged a protest outside the White House today, hours before President Obama and other world leaders are expected to sign the Trans-Pacific Partnership (TPP). See photos below, and a press release from the organizers below that. Washington, DC - As the US Trade Representative signs the TransPacific Partnership on behalf of President Obama at the Skyland Casino in New Zealand on the evening of February 3rd (Eastern US time), protests are happening across the United States and around the world. See map of protests http://www.flushthetpp.org/actions/. 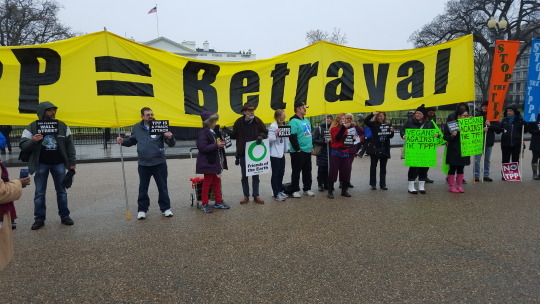 Several hours before the signing TPP opponents in Washington DC protested at the White House with a 24 foot “TPP is Betrayal” banner and other signs that visually highlighted the negative impacts of the TPP on the economy, environment and workers. 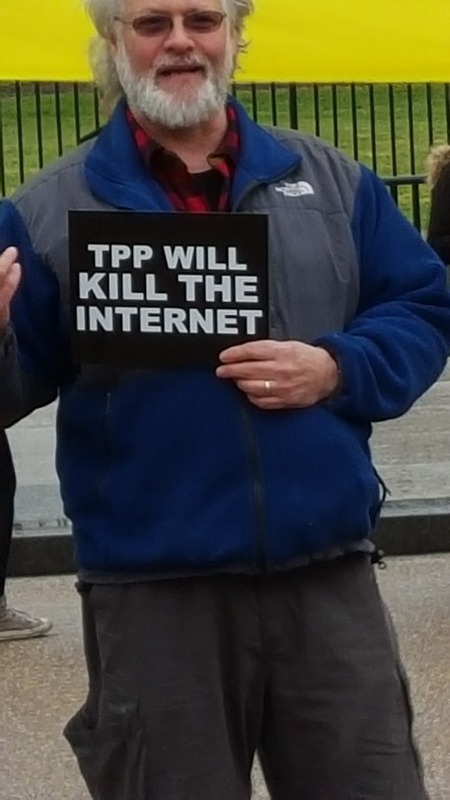 In front of the White House today, people representing the Alliance for Democracy, the American Medical Students Association, Beyond Extreme Energy, Friends of the Earth, Popular Resistance, Veterans for Peace and more spoke out against the TPP. The DC protest kicked off two days of protests in 38 US cities as well as in seven other countries demonstrating that the TPP is politically toxic and no politician should touch it in the 2016 election year. In recent weeks, protests have been escalating around the world as the signing of the TPP approaches. After the signing, countries will have two years to ratify the agreement.